Connor teaches how he went from being almost bankrupt using this strategy with no money left and was able to bridge his way into rehabbing houses and holding properties for rent or owner finance and changing his life in just a few short years. 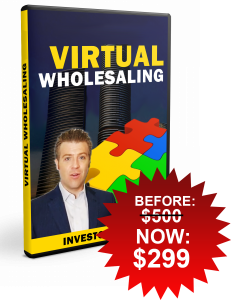 Connor Does And Teaches 4 Different Types Of Wholesaling In His Own Personal Business… This Virtual Wholesaling Program Contains Around 60 Videos And Additional Videos Will Be Added From Time To Time. Get A Membership Access Now!